Now I'm sure it has got a squillion BHP, but it just screams 'knobhead' to me. Are there any standard, non-chavved-up ones out there ? Also, why do so many seem to have had engine rebuilds ? I hear about Subaru reliability, but why so many engine rebuilds ? If it aint broke, dont fix it, is my motto. Thats why most scoobs go bang. The HUGE majority of Subaru engine rebuilds are on Jap imports that have been buggered about with to silly degrees but not recalibrated for 95/98 RON fuel (they get 100 RON in Japan). There have been a miniscule number of major engine warranty claims processed by Subaru UK on unmolested UK cars. And I mean miniscule. 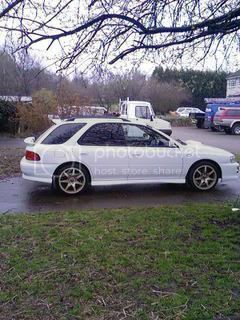 I know exactly what you mean about the image of most Imprezas - especially when going back to the Mk1. Back then there were official import limits meaning only a couple of thousand (at most) UK Turbos were sold each year - so the majority of 90s Imprezas you see now are cheap Jap imports that have been wallied up by chavs. I can't stand the 2001 bug eyed model you linked, but if you hunt around the Subaru dealers for some cheap unmolested older Imprezas you'll find a quick, reliable bargain... and the more standard it is, the less like a chavved up import it looks. They're an awesome car, that started with a true enthusiast 'cult' car image ... that has sadly been tarnished in recent years by the chavs. But I'd say don't let that, or scare stories of engine rebuilds, put you off. Thanks Steff, Garcon, appreciate this. I rather like the bugeye model myself, and I can even kid myself that the estate version is a bit of a sleeper, what kind of mpg do you get ? 28ish ?